So what is it that we have been set free for? One of the beautiful things we have been set free to do is make the Good News central in our parenting and experience God’s grace in our homes- because, as we all know, being a mom set free doesn’t mean we’re free from doing the hard and holy and humbling work of motherhood. It doesn’t mean we don’t need to be purposeful in our parenting and intentional with our instruction. What it does mean is that we *get to* rest in the assurance of God’s sovereignty and grace, as we do the hard and holy work! I’d like to share with you why this is on my heart today. Last week I had the privilege of speaking to a room full of lovely mamas of mostly little kids - mamas who held babies in bjorns and had toddlers hanging onto their legs. And while the message of freedom resonated deeply in their tired bones, they were also hungry to know some of the ways we have made the gospel a daily (and mostly enjoyable) part of our daily life with four boys who range from two to thirteen. So I want to share with you some of what I shared with them, in case it might be helpful for you. With the summer upon us, we have a great opportunity to establish new rhythms of grace in our homes and be intentional in planting seeds of faith in our kid's hearts. The early years provide incredibly fertile soil to plant seeds of faith and help our kids hide scripture in their heart, even though they have yet to discover it’s power for their lives in the future. The early years provide pivotal moments to establish our loving authority and teach our kids that we say what we mean, and we mean what we say, and we can be trusted to establish healthy boundaries and enforce reasonable consequences – with wild amounts of grace. That being said, if you’re reading this as a mama of older kids and you are just starting on this mom set free journey, or you feel like you haven’t done enough so far, don’t let the enemy feed you lies that it’s too late. It’s never too late for grace! So journey along, my friend. When we make the gospel central in our homes, we fulfill the greatest calling we have as parents – to make the love of Christ known and felt. 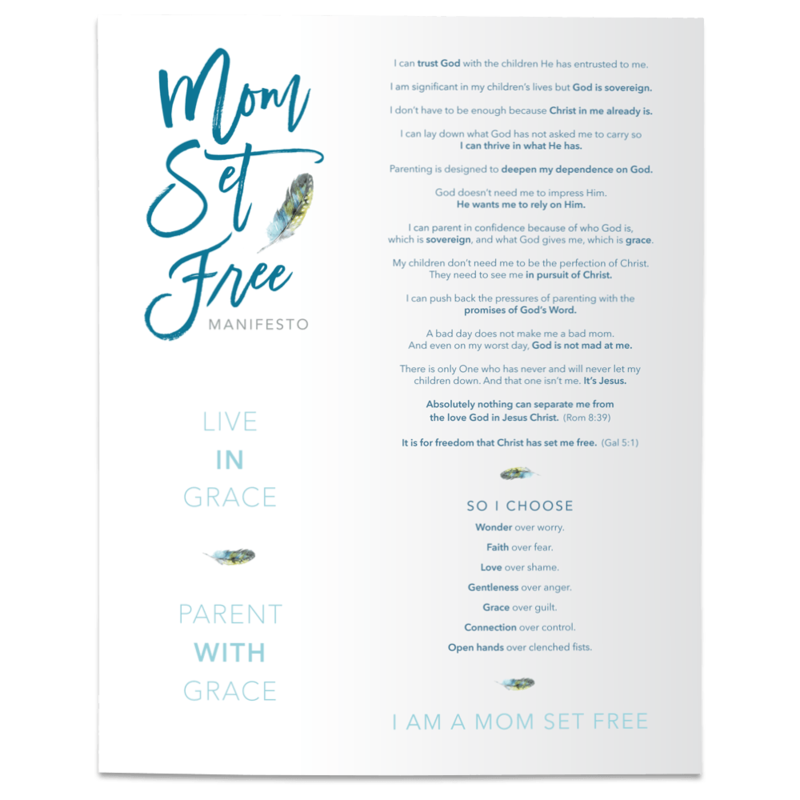 So today I’m sharing a brief excerpt from “Mom Set Free” with you about our high calling as mamas, and I hope it encourages and equips you to take that next step in making the gospel central in your homes. Also, I’ve updated the “resource section” of my website to share with you some of the tools we use to help our kids grow in their relationship with God. You’ll find some of the devotionals that our boys love best to start and end the day. (I’ve also included a few resources that I know girls enjoy too) You’ll also find the resources I rely on for growing in my own walk with God. That being said, I do believe that the posture of our hearts is more important than the practical tools in our hands. We are partnering with God in the work that HE wants to do in our kid’s hearts. The purpose of planting seeds of faith is to help our kids know God better and draw closer to His heart where transformation happens. And more than anything, I believe prayer is our most powerful parenting tool. This is why my husband and I pray with the kids before they go to school. We pray for help when they encounter something hard and we pray thanks when they experience something wonderful. We pray after an argument and we pray when we end the day. We pray and we pray because we want our kids to know the amazing access they have to God their Father. We pray because prayer gives us peace that passes understanding. We pray because our prayers are part of God’s rescue operation in our kid's lives (2 Corinthians 1:3-11 MSG). So let’s use those practical tools and stay on our knees in prayer and watch God move in power! "The common thread that binds together almost every ministry-minded twenty-something that I know is abundantly clear: a home where the gospel was not peripheral but absolutely central. This is not a formula! Kids from wonderful gospel- centered homes leave the church; people from messed- up family backgrounds find eternal life in Jesus and have beautiful marriages and families. But it’s also not a crap- shoot. In general, children who are led in their faith during their growing-up years by parents who love Jesus vibrantly, serve their church actively, and saturate their home with the gospel completely, grow up to love Jesus and the church." Indeed it is both a privilege and a responsibility. And trust me when I tell you, I’m talking to myself here because I am often convicted about how I prioritize nurturing my child’s faith. I have to continually re-evaluate what I prioritize in my kid's lives and whether I am parenting with eternity in the forefront of my mind.